Learn how to get a handle on mold problems and limit costly repairs and tenant lawsuits. 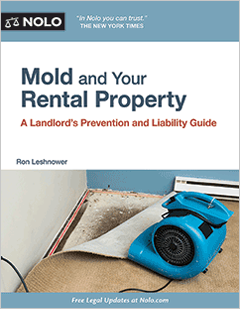 From identifying mold to cleaning it up, this book provides essential information landlords and managers need to know about managing mold in residential rental properties. This book includes sample forms, including a mold inspection checklist and model lease clauses, in the Appendix. Ron Leshnower is an attorney-author and nationally recognized expert on apartment topics. He has been invited to speak in front of audiences of housing professionals across the country, and he has appeared as an expert on CBS News and NBC News. He has also been quoted in The New York Times' "Real Estate Q&A" column, Realtor.com Advice, MainStreet.com, Debt.com, The Associated Press' "Your Money" series, the New York Daily News, Black Enterprise, Bankrate.com, the Real Estate Intelligence Report, Minyanville.com, and the Landlord Law Report, among other publications. As the Founder and President of Fair Housing Helper, Ron conducts private fair housing training and runs the popular FairHousingBlog.com and FairHousingResources.com. He is the author of Fair Housing Helper for Apartment Professionals (Hillocrian Creative), a Finalist in the "Business: Real Estate" Category of the 2014 International Book Awards, and Every Landlord's Property Protection Guide: 10 Ways to Cut Your Risk Now (Nolo), an Amazon.com #1 multi-category bestseller that can be found in law schools and libraries across the country. In 2008, The New York Times Company's About Group selected Ron as the About.com Guide to Apartment Living / Rental, a role he held for nearly six years. In that capacity, he wrote hundreds of articles and blog posts offering useful tips, explanations of key industry developments, and insightful commentary on a wide range of topics pertaining to rentals. In addition to Nolo.com, Ron has written articles on a range of real estate topics for the National Apartment Association's Units Magazine, Landlordology.com, as well as several trade newsletters, and he has also contributed as a guest blogger for MyNewPlace.com. Ron earned a B.A. from Yale University and a J.D. from Boston University School of Law. He is admitted to practice law in New York and Massachusetts and is a member of the Authors Guild. Many landlords start thinking about mold when it makes a startling appearance one day at their rental property. Even then, some landlords don’t take mold seriously, dismissing it as little more than an unsightly stain that can be painted over and then forgotten. But mold is often more than just a superficial or cosmetic issue. It’s a scourge that has led tenants to bring multimillion-dollar lawsuits against landlords, seeking compensation for significant health problems they claim to have suffered following prolonged exposure in their rented homes. Mold has also cost landlords a bundle in repairing damage to their property, including sensitive, structural components. Plus, a mishandled mold problem can lead to negative press and social media comments, such as on Yelp or Twitter, harming a landlord’s reputation and leading good prospective tenants to look elsewhere for their next rental. Fortunately, as problematic as mold may be, it’s a risk that every prudent landlord can endeavor to manage. With a little knowledge about mold and the circumstances that lead to mold problems, you can take steps to keep this hazard at bay, lowering the likelihood of a mold outbreak at your property. This book shows how. getting familiar with relevant liability and insurance issues. To supplement this information, this book also includes sample forms, lease clauses, and checklists you and your staff can begin using today to help prevent mold problems tomorrow. You’ve no doubt heard of mold, but do you know exactly what it is? Mold is a form of fungus that can be found nearly everywhere. It grows both indoors and outdoors and thrives in warm and damp or humid environments. In a rental property, you may spot mold on paneling, wallboard, carpeting, paint, ceiling tiles, clothing, furniture, and other substances that can retain moisture and become ideal breeding grounds for mold. When mold grows, its presence suddenly becomes visible, appearing in amorphous clusters of black, green, gray, or white. Even when mold is hidden behind walls, under floors, or above ceilings, it can sometimes be detected by a suspicious, musty odor. Although we often hear about just “mold,” this fungus actually comes in over a thousand different varieties. Indoor mold is so common that it’s almost certainly in your building right now. As long as mold exists in undetectable amounts, it’s no cause for concern, and even a moderate amount of mold generally isn’t harmful to anyone’s health. Mold shares the spotlight with asbestos, lead, radon, carbon monoxide (CO), and bedbugs as a top environmental hazard affecting rental properties. If you have experience dealing with other environmental hazards at your property, don’t assume you know how to handle mold. Just as each environmental hazard is different, the practical and legal considerations landlords need to keep in mind to keep tenants safe and minimize their liability are different. For more information and tips for handling other top environmental hazards at your rental property, see Every Landlord’s Legal Guide, by Marcia Stewart, Ralph Warner, and Janet Portman (Nolo). Because mold does well in places that have warmth and wetness, indoor mold is most commonly found in parts of a building that are prone to moisture or ventilation issues, such as bathrooms and basements. Under certain conditions or after certain events, untraceable amounts of mold may concentrate and reproduce, leading to visible signs of a problem. For example, mold tends to thrive following any type of flooding, such as a roof or pipe leak, drafty windows, or in the wake of a strong storm. There’s much misinformation about mold and how to deal with it effectively at a rental property. Here’s a debunking of the most common mold myths. Myth #1: Mold is okay if it’s not “toxic.” The term “toxic mold” has been used in various ways, leading to some confusion about the hazards that mold poses. There are over a thousand varieties of indoor mold, and while some types of mold may present more of a health risk than others, all molds can trigger health problems. Plus, keep in mind that all types of mold can cause serious damage and ring up expensive repair bills, even if tenants remain healthy. Myth #2: Every building should be 100% mold-free. The presence of a small or even moderate amount of mold in a building or rental unit shouldn’t present a significant health risk. Just as you can’t rid your property of all germs and bacteria, aiming to eradicate all mold is also unrealistic (and, fortunately, unnecessary). If the concentration of mold in your building isn’t enough to be visible on walls or other surfaces, it’s not a concern. Myth #3: A mold problem will go away on its own. You can’t expect a high concentration of mold to simply go away. Even if you’ve identified and put a stop to the issue that caused the mold (such as a leaky pipe), the mold won’t naturally evaporate or fade. On the contrary, if left untreated, mold may grow into a larger problem, causing more damage and posing a greater health risk. Myth #4: Other than being unsightly, mold poses no substantial risks. Mold itself is not a pretty sight, and seeing mold blemish expensive furniture, cherished items, or freshly painted ceilings can be particularly disconcerting. But a mold problem is more than a cosmetic issue. Mold may run deeper into a surface than you might think, and it could even require the replacement of key structural components of your building, such as an entire bathroom wall or floor joists. Also, the presence of a serious mold problem may indicate an underlying leak or ventilation issue that needs to be addressed. Myth #5: To protect tenants’ health, sometimes the best strategy is to leave mold alone. This plan may be advisable when it comes to dealing with some environmental hazards, such as intact asbestos, but it is not at all applicable to handling a mold problem. Mold doesn’t become any more harmful when it’s disturbed, and leaving mold alone only allows it to grow into an even larger, costlier problem. Myth #6: The worse mold looks, the more harmful it is. When it comes to mold, ugliness is in the eye of the beholder. You can’t tell exactly how harmful a variety of mold is to tenants’ health simply by looking at it. If mold is present in a concentration that’s high enough to cause unsightly stains, it should be removed, both for the potential health risks as well as for the sake of keeping a property safe and sound. Myth #7: Mold is a problem specific to properties in wet climates. While a humid climate could be an underlying cause of a mold problem, keep in mind that water and plumbing are present at rental properties across the country. As a result, the potential for a mold problem exists as well. In fact, Texas, which is considered a relatively dry state, had the highest mold loss rate based on insurance claims, according to data compiled by American Risk Management Resources (ARMR), an environmental insurance brokerage firm. Nevada, Arizona, and South Dakota were also in the top ten. Massachusetts and Alabama, coastal states known for a wetter climate and more rain, ranked among the states with the lowest mold loss rate. For details, read the press release from Greenguard Environmental Institute. Additionally, modern construction techniques result in an almost air-tight home; this translates into little or no natural ventilation. If tenants keep the windows and doors shut, they’ve created a sealed container that won’t allow even everyday moisture to dissipate. Mold spreads from one place to another by generating invisible spores, which travel through the air through open doors, windows, and heating and air-conditioning systems. When these spores land on tenants’ clothing, bags, or pets, they gain entrance to places like apartment buildings, where they can cause serious harm. Unlike mold itself, which thrives on wet substances, these spores can survive for long periods of time in dry places, making elimination a challenge. other building products, such as paint and insulation, and even dust. Mold has caused so many people to take ill that the term “sick building” has entered our modern lexicon as a popular way to describe structures with mold or other suspect indoor air problems. Mold isn’t specific to residential apartment buildings, duplexes, condos, or single-family homes. Indeed, it has caused problems in all types of structures, from schools and ferry terminals to office parks and even hospitals. But when mold strikes at a residential property, it can create a more complicated, challenging situation than at other types of properties because of the fact that people actually live there. Employees at an affected office building can temporarily work at another location or even from home until a mold issue is resolved, but an apartment building or house is a place where tenants (along with any pets and occasional guests) live and sleep, and it’s where their furniture and other personal belongings are kept. As a result, tenants may be faced with difficult choices. Although landlords may be responsible for their tenants’ temporary relocation following a mold outbreak, landlords who refuse to forgive rent or otherwise assist their tenants with relocation may help create a situation in which tenants of limited means continue living in their homes at the risk of illness. DOWNLOAD FORMS - All forms in this book are accessible online. After purchase, you can find a link to the URL in the chapter titled Mold Basics.